Arya is a 3/8 Peruvian and 5/8 Chilean beauty with first class genetics from across the country. 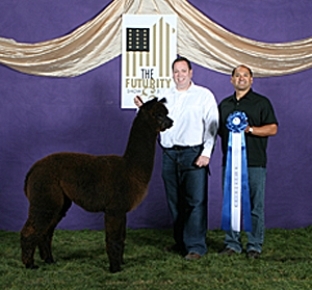 Her sire, Bellagio of PVA, is a multi-champion and award winning beige herd sire who is a grandson of both PPPeruvian Augusto and PPeruvian Camilio. Her Dam, Grand River Amarige, is also a multi award winning gray female out of the renowned Dark Shaddow. 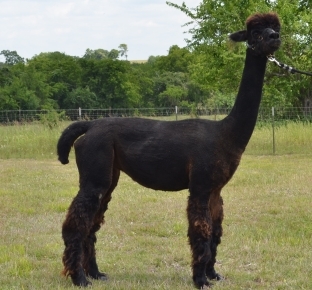 Arya is an eye catching beauty with a regal stance and stunning conformation. Her bite is perfect and her substance of bone is extraordinary. Her black fleece is dense, dense, dense and brilliant! She has wonderful definition of crimp and some bundle formation. The handle of her fleece is luxurious. She has just begun her show career and her first two shows were at the TXOLAN Alpaca Spectacular and at the nation's largest livestock show and rodeo-The Houston Livestock Show and Rodeo. She did great! She won first and Color Champion at both shows!